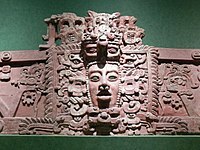 This article is about the Maya bat god. For the fictitious planet, see A Wrinkle in Time § Locations. In Maya mythology, Camazotz (/kɑːməˈsɒts/ from Mayan /kämäˈsots/) (alternate spellings Cama-Zotz, Sotz, Zotz) was a bat god. Camazotz means "death bat" in the Kʼicheʼ language. In Mesoamerica the bat was associated with night, death, and sacrifice. Camazotz is formed from the Kʼicheʼ words kame, meaning "death", and sotz', meaning "bat". In the Popol Vuh, Camazotz are the bat-like monsters encountered by the Maya Hero Twins Hunahpu and Xbalanque during their trials in the underworld of Xibalba. The twins had to spend the night in the House of Bats, where they squeezed themselves into their own blowguns in order to defend themselves from the circling bats. Hunahpu stuck his head out of his blowgun to see if the sun had risen and Camazotz immediately snatched off his head and carried it to the ballcourt to be hung up as the ball to be used by the gods in their next ballgame. In Part III, chapter 5 of the Popol Vuh, a messenger from Xibalba, in the form of a man with the wings of a bat, brokers a deal between Lord Tohil and mankind, wherein mankind promises their armpits and their waists (the opening of their breasts in human sacrifice) in exchange for fire. The Minyades - three sisters in Greek mythology who were turned into bats and owls. ^ Miller & Taube 1993, 2003, p.44. ^ Miller & Taube 1993, 2003, p.44. Thompson 1966, p.181. Read & Gonzalez 2000, p.133. Christenson, Allen J. "Kʼicheʼ--English Dictionary and Guide to Pronunciation of the Kʼicheʼ-Maya Alphabet" (PDF). Foundation for the Advancement of Mesoamerican Studies, Inc. (FAMSI). Retrieved 2010-01-16. Miller, Mary; Karl Taube (2003) . An Illustrated Dictionary of the Gods and Symbols of Ancient Mexico and the Maya. London: Thames & Hudson. ISBN 0-500-27928-4. OCLC 28801551. Read, Kay Almere; Jason González (2000). Handbook of Mesoamerican Mythology. Oxford: ABC-CLIO. ISBN 1-85109-340-0. OCLC 43879188. Thompson, J. Eric S. (June 1966). "Maya Hieroglyphs of the Bat as Metaphorgrams". Man, New Series. Royal Anthropological Institute of Great Britain and Ireland. 1 (2): 176–184. This page was last edited on 31 March 2019, at 00:26 (UTC).